As the girls refuse to use the superglug and bury their other drinker I bought a different type. That looks like a great idea for a water bottle !! This looks like one that someone mentioned years ago and they imported from Australia. I like the look of this. Wonder if you can get it in the U.K.? I got it from Ebay UK. Delivery was quite fast. This one holds 3 litres. They do smaller versions that have opening tips so you don’t have to move them to refill but they are only 500ml or 1l. They used to bury the traditional drinker several times a day. This has stayed clean. It’s sitting on a few bricks, in the paved part of the run. But still they manage to get it mucky somehow. 😒 But thanks for the suggestion anyway! Think I might get one of those AJM - thanks. Easier for when others are looking after the girls. I have something similar which I use in the broody cage - it has the sipper cup and attaches to any plastic water bottle. Mine drink from Glugs, which have heat pads underneath in this cold. 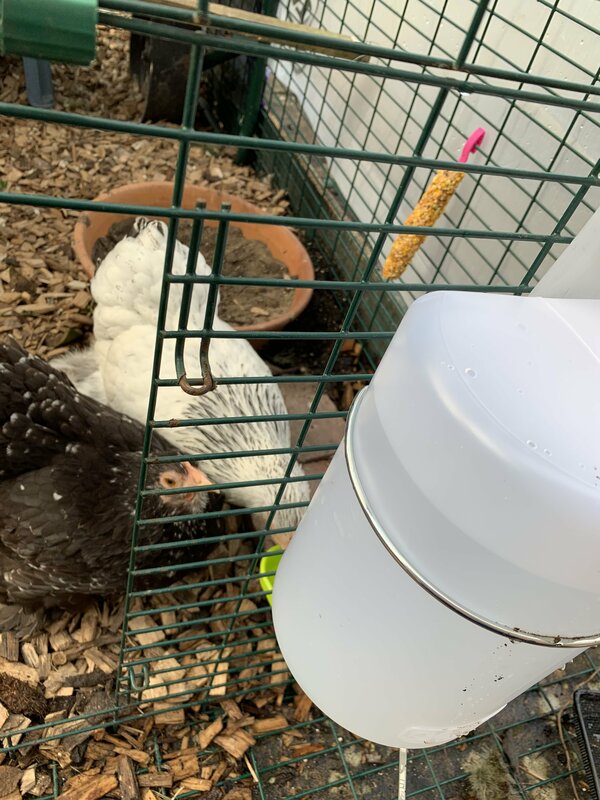 Just wondered how the cup stays clean - my rabble wash muddy beaks in theirs, but then I am able to tip the thing sideways to drain the dirt out. I also have the glugs and the little blue (water - all colour coded! LOL) cups with hooks (forget what they are called) stashed around and then with this weather I've gone armed with warm water to break the ice. They love warm water! Mine has stayed really clean so far but Pekins are quite dainty when they drink from it. I refresh the water every day as we have other outdoor animals and the rabbit (who died yesterday) used to refuse to drink ‘old’ water. Just got mine. Will fit it over the weekend.